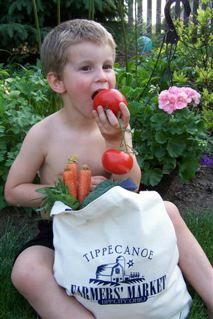 Tipp City, Ohio, will be enjoying the 7th week of the local farmer’s market tomorrow. It is great to see so many people up early on a Saturday morning walking along the closed off street admiring the produce offered by local growers. Beans, beets, peppers, tomatoes, cherries, cucumbers, corn, melons. The list of nutritious and super fresh fruits and vegetables goes on and on. It’s easy to see why so many people go home with their arms full of goodies. It’s a visual delight as well, since fresh cut flowers are available from Springhill Nursery’s test and display garden are arranged in attractive and reasonably priced bouquets. Another vendor has annuals and perennials for sale. Candles and lotions are brought to the market by another local family. Bowman and Landes free-range turkey farm brings some smoked turkey products as well as a selection of gourmet treats, relishes, sauces, and preserves. There is even Market-made ice cream available. Every week more produce is available as each matures throughout the summer. I can’t wait to see what is new this week. If you have never had osso buco (alla milanese), you are missing one of the most exquisite dishes ever concocted. Served with saffron flavored risotto, the delicate taste of the veal shanks braised in wine, tomatoes and aromatics is what I would order for my last meal on earth. It is surely what God in heaven eats regularly. Originating in Milan, the capital of Lombardy, osso buco (“bone with a hole”) has a tasty marrow filling that I save for the last bite. I use a long handled baby spoon to reach for every last morsel of the marrow. Marrow spoons used to be a part of silverware sets, back when wasting anything edible was unheard of. If you are opposed to eating veal, then this dish is not for you. I have no opposition to veal, other than the exorbitant price that veal shanks and chops carry. That, along with the difficulty finding any veal at all, keeps me from enjoying it as often as I would like. Sometime I will prepare polenta instead of risotto with the osso buco. Today, I am fixing the risotto. 2. In a large heavy bottomed Dutch oven, heat the oil and butter. Meanwhile, season the veal on both sides with salt and pepper and dredge in flour, shaking off the excess. 3. When the oil is hot, brown the meat on both sides, about 5 minutes per side. Place them on a plate and cover with foil to keep them warm. 4. Add the chopped vegetables to the oil and stir constantly to prevent the garlic from burning. When the veggies are soft, add the wine and bring to a boil, scraping up any brown bits on the bottom of the pan. Add the tomatoes and their juice. 5. Put the veal back in the pan and add enough of the chicken broth to come almost to the top of the veal. Bring to a boil and cook for a few minutes. Add the bouquet garni. 6. Cover tightly and put in the preheated oven for 2 hours. 7. Prepare the gremolata by combining the 3 ingredients and setting aside in a small serving dish. Here is my risotto recipe for occo buco. 1. Put the broth and water in a saucepan over medium-high heat and bring to a simmer. Lower heat, but keep it simmering lightly. medium heat. When the butter bubbles, add the onion and cook, stirring occasionally, but don’t let it brown. After about 3 minutes, add the rice and stir to coat the rice with the butter. 3. Pour the wine over the rice and stir. Let the wine evaporate almost entirely. 4. Crumble the saffron and add to the rice. Then add the stock, just 1/2 c., to the rice and stir nearly constantly to prevent the rice from sticking to the bottom of the pan. When the broth/water mixture has nearly evaporated, add the next 1/2 c. broth. 5. Continue in this manner, adding broth and stirring, until almost all the broth is used, about 20-25 minutes. Keep the heat on a medium-low setting. The goal is to let the rice slowly absorb the liquid and attain tenderness in its own time. Depending on the rice, it can take as little as 20 minutes, or as much as 30. It can take 3 c. of liquid or 4. Taste the rice to determine when it is tender. You don’t want “al dente” rice here, you want a creamy tenderness. You may have some liquid left over, or you may need to add more. It’s a judgment call. 6. When the rice is tender and has absorbed all the broth it is in, add the last tablespoon of butter and stir in the Parmesan. Serve with the veal and juices on top of the risotto. Enjoy with a glass of Italian wine, either white or red, a green salad and some crusty bread to sop up any remaining juice on your plate. In case you are wondering, I am still making the no-knead bread, about 4 loaves per week. I had a week when I was out of town and had to eat some grocery bread when I returned home until I could bake a loaf. What a difference. Grocery bread is just a vehicle for getting the meat/cheese and the rest of the sandwich fixin’s into your mouth. Homemade bread is something else, entirely. It is the excuse for making a sandwich. I have been experimenting with different kinds of flour, rising times, rising methods. I tried for a few weeks letting the dough rise for the second time in an oiled bowl. It was fine. As I have said before, you can’t really ruin it. Today, I went back to the original directions and after about 18 hours for the first rising, I formed the loaf and let it rise on nonstick foil for 2 hours and then baked it at 460 degrees for 30 minutes, covered, and another 15 minutes uncovered. I also used 1 c. unbleached bread flour and 2 c. regular all-purpose flour. With 2 t. salt, 1/2 t. yeast, a pinch of citric acid, it is delicious. I did sprinkle it with a seed mixture and some kosher salt just before baking it. It is very good. In fact, it’s hard to keep away from it. Because I am trying to stay away from a lot of carbohydrates, it is extremely difficult to make such good bread and not eat it constantly throughout the day. I think that the best flavor is achieved with regular all-purpose flour and unbleached bread flour combined. I have tried the special artisan flours and can’t really say that it is an improvement. It certainly is cheaper. Mix together, cover with plastic wrap and let sit in a warm place (on the kitchen counter is fine) for at least 12 hours and up to 18. Scrape out of bowl onto a floured surface. Fold over once or twice, cover with the plastic wrap and let it rest for 15 minutes. Set out a piece of non-stick foil and sprinkle a little flour over it. Pick up the dough (a dough scraper or spatula makes it easier) and reform the loaf somewhat and set it on the foil. Sprinkle the top with a little flour and lay a kitchen towel (not terry cloth) over it and let it rise for 2 hours. After 1 1/2 hour, preheat the oven to 460 degrees with a covered heat proof casserole (I use a 3 qt. Corningware ceramic pot with a lid) for 30 minutes. Remove the casserole from the oven carefully and drop the loaf into it. Sprinkle the top with a seed mixture if desired and/or kosher salt (optional). Bake covered for 30 minutes, uncover and bake for 15 minutes more. Remove from oven and the pot and let the loaf cool on a rack. Sometimes I brush it with melted butter. It will keep for a day or two. Potato salad is one of our favorite summertime side dishes, as it is for many people. We like both the traditional mayonnaise based salad and a new one using a vinaigrette with balsamic vinegar. Today I added some fresh green beans. First I steamed the beans, after trimming and breaking them into bite-sized pieces. I refreshed them in cold water, and blotted them partially dry with a kitchen towel. Then I drizzled them with a teaspoon or so of balsamic vinegar and added a small handful of chopped red onion. In the meantime, I steamed some small red potatoes and left them unpeeled. 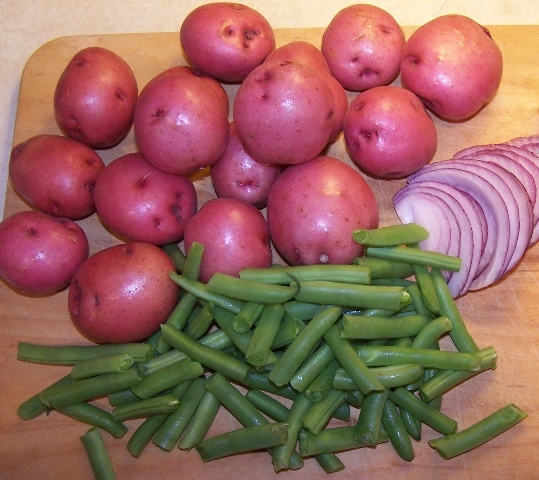 As soon as them were tender, I added them to the mixing bowl with the green beans and onions and another teaspoon or two of balsamic vinegar, just enough to coat the potatoes. By the way, I cut the larger potatoes in half to make them more manageable to eat and to provide more surface area for the vinegar. Then they sat on the counter for a few minutes to cool a bit while I went outside to pick some fresh parsley. I chopped the parsley and added it to the vegetables along with a tablespoon of vinaigrette that I had already made. A good grind of pepper and a tablespoon of mayonnaise when the potatoes were cool, and the dish was ready to serve. It is best at room temperature, but can be kept in the frig until time to eat. With the potato salad all ready at 4:00, I had no choice but to put in in the refrigerator until dinner, which I knew would be around 8:00. I had a flank steak marinating in a teriyaki sauce and fresh cherry tomatoes from our tomato plants ripe and ready to harvest. About 20 minutes before we ate, Mac started the grill and I sliced two zucchini, some green onions, and a handful of mushrooms. I sauteed these in a tablespoon of olive oil and a dab of butter. After 10 minutes, I added a chopped garlic clove, salt and pepper, gave it all a couple of stirs and it was ready to go. Mac cooked the steak, brought it in and we sliced it thinly on the diagonal to keep it tender. It tasted great and was nice and juicy. In the summer, I like to sit outside in the evening with a glass of wine and discuss the day with my husband or play with the grandchildren if they come over. I don’t want to have to spend a lot of time fixing dinner after we go inside. I therefore try to make some preparations early in the day, or plan a meal that requires little work right before mealtime. Here was a meal that was delicious, but not time consuming. The steak had been marinating since noon; it took 1 minute to prepare (I used Kikkoman teriyaki sauce), and eight minutes to cook. The potato salad took 40 minutes, but a lot of that was just waiting for the potatoes to cook, and I did that early in the day. The zucchini was fixed internal to the steak cooking, and required only slicing the veggies and giving them a stir while they cooked every now and then. That’s what I call a no-stress meal. My daughter came up with a quick and easy appetizer last week. She gave me permission to share it with the “world” at least that part of the world that stumbles upon my humble writings. It starts with fresh basil leaves, the larger, the better. I found a basil plant in a local nursery this year that has the most gigantic leaves I have ever seen. They are about the size of a 3 X 5 index card. The plant itself is about 18 inches tall, even though we have been harvesting from it and cutting it back for the past three months. I hope I can keep it alive in the house through the winter. It is a remarkable variety. I don’t know what it is but I will try to find out. The next ingredient is mozzarella. Get the best, freshest that you can. Forget the ordinary “Kraft” like mozzarella. Find the freshest. Also, get good tomatoes. Here is the recipe, straight from my daughter. Cut the mozzarella either into small balls or cubes small enough to be enclosed in a basil leaf. Cut tomatoes in half, then each half into slices, creating flat bite-size pieces. Drizzle with olive oil and season with salt and pepper. Take a basil leaf, put a small piece of cheese in it, then and a slice of tomato. Roll up the edges to create a little package and stick with a toothpick to hold it together. Store in refrigerator for an hour if necessary or serve. You can added small pieces of smoked salmon (lox) to give it more salty flavor and substance. Maybe a bit of salami would be good. Give it a try. Our town had its weekly farmers’ market today. What fun it is so see so many people downtown milling around enjoying each other’s company and the bounties of our local farmers. One block is closed off to traffic and stalls line both sides of the street with vendors selling a variety of things. There are a few people selling baked goods, bread, muffins, cakes and pies. Another family sells homemade scented candles and lotions. A local nursery features cut flower arrangements fresh from their test and display gardens. Another gentleman has potted annuals and perrenials to fill in those bare spots that show up this time of the year in our gardens. 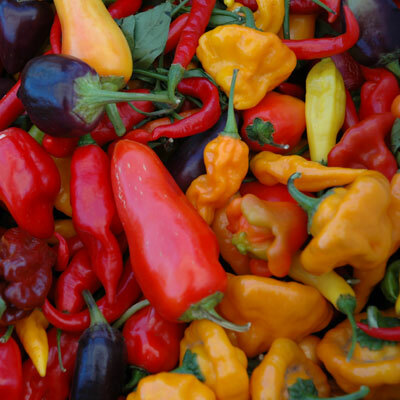 Naturally, there are several stalls featuring seasonal produce; tomatoes, peppers of all shapes, sizes, and hotness, green beans, beets, cabbage, kohlrabi, and finally corn on the cob. I went to the market to buy only tomatoes, and came home with 4 ears of corn, 3 green peppers, 2 tomatoes, a head of purple cabbage, a quart of strawberries, and a cantaloupe. Since I rode my bike to the market, I was glad to see my husband drive up after his golf lesson so he brought the food home with him in the car I must get a basket for my new bike. My old basket doesn’t agree with my new bike’s handlebar/front wheel configuration and I haven’t yet found a good alternative. We had BLT’s for lunch today with tomatoes just picked this morning and some fresh melon that was melt-in-your-mouth delicious. Tonight we will have shish kebab with peppers and beef, corn on the cob from the market, and strawberries and ice cream. Wow. Summer is great and the organizers of the farmers’ market deserve more than a round of applause. It was a tremendous addition to our town’s activities and appeal. My friend Lacey prepared a great lunch today for our knitting group. She served a salad with grilled chicken breast mixed with fresh greens, sliced strawberries, pecans and a creamy poppy seed dressing. We had hot rolls and fresh fruit salad supplied by Vicki. The surprise of the meal was a grilled apple pie. Lacey’s son, a first lieutenant in the Air Force, taught her the clever method when he was home over the July Fourth holiday. It was quick to prepare, very tasty, and didn’t heat up the kitchen. I will try to give you the directions. Remember, I didn’t do the cooking but I watched her from beginning to end. Spray the skillet with Pam, or grease with shortening or butter and put the filling in the skillet. Add a sliced apple and season with a little cinnamon and sugar. Stir slightly to mix. Cut the crust into strips, about 3/4″ wide, and cover the skillet with the strips arranged in a lattice. Sprinkle the crust with a little more cinnamon and sugar if desired. Put on a preheated grill at medium heat, covered, for 15-30 minutes. Check after 15 minutes. If the crust is browned nicely, it is done, if you used canned apples. It will take longer and probably a slightly lower heat for fresh apples. I intend to try this a few different ways and will update this post with my results. I wanted to present this idea to you as soon as possible for you to try on your own.